Sir Fred Hoyle taught mathematics and was Plumian Professor of Astronomy and Experimental Philosophy at Cambridge University, and was professor-at-large at Cornell University. He is currently the Honorary Resident Professor at both Manchester University and University College, Cardiff. He has suggested the currently accepted scenario of the build-up to supernovae, in which a chain of nuclear reactions in a star is followed by a massive explosion, in which matter is ejected into space, and recycled in second-generation stars which form from the remnants. He is the author of several books including Nature of the Universe and Frontiers of Astronomy as well as science fiction, stories for children and two volumes of autobiography. John Elliot was a leading BBC television producer and writer who also wrote a number of distinguished novels. From two hundred light years across the universe comes a message of terror. 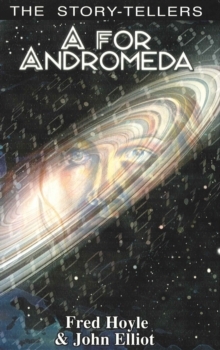 Ten years from now, a new radio-telescope picks up from the constellation of Andromeda a complex series of signals which prove to be a programme for a giant computer.When the computer begins to relay the information it receives from Andromeda, the project assumes a vital importance, for scientists find themselves possessing knowledge previously unknown to man, knowledge of such a nature that the security of human life itself is threatened.